My least favorite aspect of AGW is the political one, however, Tom is completely fearless, imagine if Real Climate gave me an opportunity to guest post on the politics of global warming. The odds are exactly equal to rolling 23,000 sixes in a row. Be nice. Roger Pielke stepped into a hornet’s nest here a few days back. I think one of the reasons is the name he chose for his intended solution, ‘decarbonisation,’ has a bad ring to it in some quarters, and one of those quarters is headquartered here at The Air Vent. I believe that global warming is real and that we should do something about it. But I don’t believe the consensus that it is going to be catastrophic and that we need to completely reorganise every aspect of our lives to face it. So I’m caught in the middle between skeptics like Viscount Monckton who think nothing at all needs to be done (slight exaggeration) and Al Gore, who thinks that a massive Cap and Trade program is a good beginning. Open Thread #2 – AGW Smackdown? Defend your position, Knave! It’s not really time for another open thread but this topic was suggested on the Reader Background thread by Robert E Phelan. Everyone knows my opinions on global warming, so that’s not very interesting. CO2, capturing of warmth is real. The magnitude of the warmth captured is not known, the dangers from the warmth are not known and no ill effects of warming have been demonstrated. My preferred solution to global warming is duct-tape………. for the mouths of the politicians and scientists who act like politicians. Confusion about sea ice still reigns as some climate scientists still haven’t got the news about climategate. Business as usual seems to be the mantra amongst most, while others have clearer vision of what science should be. 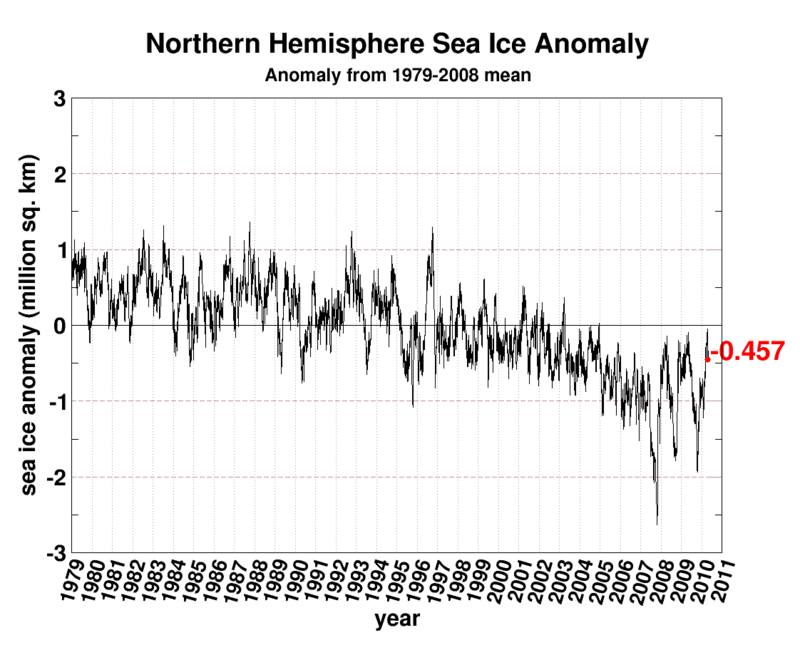 The NSIDC released its report on sea ice which shows this plot. This plot and associated post has changed my once good view of the NSIDC. Previously they seemed slightly biased but within the bounds of reason, this post on the state of sea ice has changed my mind. 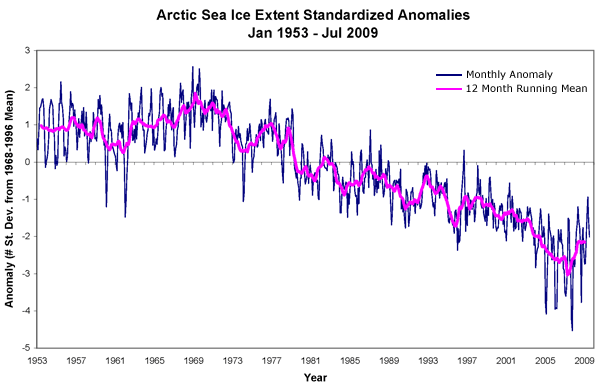 They pasted observations on pre1978 data to continue to make the sea ice appear to be melting. Since we currently have average sea ice conditions, seeing them tack on weak data to continue the alarm is as obnoxious a trick as any ‘hide the decline’. Climatequotes asked me to run this while I was gone to the trade shows. AR4 has so many problems in its economic and damage from global warming conclusions that the whole document isn’t credible. It’s going to be fun to see how they make it even better for 5. Unfortunately the well funded/organized denial machine has taken a couple of years just to check the sources. It’s a crazy world these days, up is down, true is false and left is right. I was looking through the AR4 recently in order to look at the recent Bangladeshi scientist’s claim that the AR4 exaggerated how much sea level rise would affect their country. That may be another post, because I found another false claim related to Bangladesh. Evidence of the impacts of climate-related factors on mangroves remain limited to the severe destruction of mangroves due to reduction of freshwater flows and salt-water intrusion in the Indus delta and Bangladesh (IUCN, 2003a). Notice the “and Bangladesh” on the end. The claim is that the climate-related factors of reduced freshwater flow and salt-water intrusion are causing severe destruction of mangroves in both Pakistan’s Indus Delta and in Bangladesh. The Bangladesh claim is what I am focusing on in this post. I’ve made a lot of statements about CO2 recently. My current opinion from every source I’ve found is that there are no verified negative consequences of CO2. Nothing. Calling CO2 a dangerous pollutant is more than a bit overstated and calling for decarbonization has no foundation in science. Besides, if the scientists get their way, the plants are going to be really pissed off. The Intergovernmental Panel on Climate Change (IPCC) claims that human emission of CO2 causes catastrophic global warming. When such extraordinary claim is made, every one with background in science has to look at the data and verify whether the claim is justified or not. In this article, a mathematical model was developed that agrees with observed Global Mean Temperature Anomaly (GMTA), and its prediction shows global cooling by about 0.42 deg C until 2030. Also, comparison of observed increase in human emission of CO2 with increase in GMTA during the 20th century shows no relationship between the two. As a result, the claim by the IPCC of climate catastrophe is not supported by the data. Fossil fuels allowed man to live his life as a proud human, but the IPCC asserts its use causes catastrophic global warming. Fortunately, the global warming claim by the IPCC that “For the next two decades, a warming of about 0.2°C per decade is projected for a range of SRES emission scenario”  is not supported by observations as shown in Figure 1, which shows a plateau for the global mean temperature trend for the last decade. Figure 1. Observed temperatures are less than all IPCC projections. The observed temperatures are from the Climate Research Unit of the Hadley Center . Figure 1 also shows that the observed temperatures are even less than the IPCC projections for emission held constant at the 2000 level. Can you imagine any discoveries or conclusions in climate science would indicate that accelerated decarbonization of the global economy does not make sense? Now he is right that “climate science” AKA Scientology– today won’t conclude or present evidence otherwise, however he conveniently assumes the whole government funded exercise hasn’t been polluted by preferential funding. Like so many individuals sheltered from the war that is small business, he advocates accelerating ‘decarbonization’ despite the fact that so many questions remain unanswered and despite the massive pressures already on global business. In Pielke’s vast worldly experience, he can’t think of any reason not to accelerate the decarbonization of our society. Well, it looks like it will fall on those of us who produce product for a living to help the good doctor think of a few. There are two places on the Internet today where qualified people from both sides of the debate on climate change can actually have a civil discussion about issues of scientific substance. Those places are ‘My View on Climate Change’ run by Bart Verheggen and ‘The Blackboard,’ run by Lucia Liljegren. Coincidentally, they are both the ‘kindest’ bloggers on either side of the issue. By kind, I don’t mean they are marshmallows. Lucia has had comment wars on Climate Audit with scientists that are long and heated. And Bart Verheggen holds much the same opinion of me as does Tim Lambert–that I’m wrong, and dangerous to boot. But he’ll have long, patient and civil discussions with me about the error of my ways and never once discuss my ancestry, personal habits or probable destination. People looking for logical reasons why alliances and enmities form in the climate blogosphere will be disappointed. Our next pair of weblogs shows why. Only in it for the Gold and Roger Pielke Jr.’s eponymous weblog would have their owners facing each other at dawn with pistols in hand. And yet there seems to be very little science they disagree on. Alexa ranks Only In It For the Gold at 359,414 (out of billions) and Roger Pielke Jr. is not ranked. Yes, I’m putting the ‘k’ back in skeptic. Popular Technology has been adding links to a resource they have created for papers which have non-consensus views. In my experience, the devil is often in the details so when reading, don’t go by the titles and abstracts but get the papers and check them out. 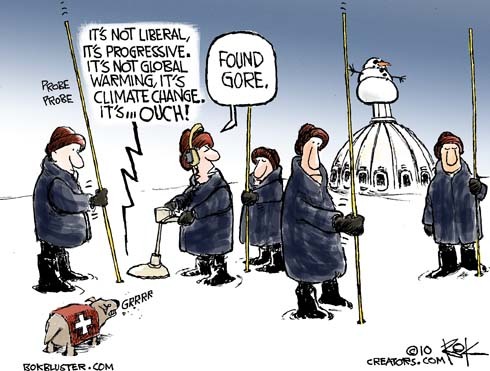 Still they have successfully listed 700 papers which they claim have non-consensus views on climatology. At least a couple of them have storied pasts due to the gauntlet they were forced to run to reach published status. There is one in particular by McIntyre McKitrick again which is a valid criticism of Santers work validating models. The paper hasn’t been allowed by the powers that be to take its rightful place on the list as of yet. It’s an interesting resource, check it out. Kendra on the last thread suggested a discussion of our various backgrounds and how we came to be interested in climate science. It’s not my normal around here but neither is arguing for the true warming effects of CO2 to be recognized by skeptics. I think it would be interesting to hear from some of you on your backgrounds and what got you into the science. My background education is Aeronautical Engineering BS and a partial Masters, after running out of money trying to pay my way through school I left college. So I’m sitting at a party a couple of years ago and someone tells me something about AGW. I told him I thought the whole thing was a political scam. That was the end of the conversation as he agreed with me, but at the time I’d only looked into the basics. I thought if I’m going to shoot off my mouth about it, I had better learn some more. I searched the internet and started reading. The first person I asked questions to was at RC, gavin – who I had no idea who the guy was other than he seemed to think he knew what he was talking about – answered a few questions on ground temp data. I kept looking and reading and decided after a while to blog on it. Blogging is like teaching, which I’ve done a little of, in that you are forced to learn the subject better than you otherwise would before you can write a thing. Half the people here are equally or more educated as myself in different aspects of AGW. It was really unfortunate that one of the first things I ran into was Mann’s 08 work. I mean that guy stinks to high heaven and for that work to go through peer review, is absolutely unconscionable. I’d like to express my thanks to Jeff for letting me guest blog here. I’m sure he needs the break, but I need a neutral forum even more than he needs his rest. I don’t want people to think I’m doing this to attract traffic to my own webspace, so this is a big opportunity for me. What I’m trying to do is describe an ecosystem by pairing up bloggers with similar profiles to see what we learn. As some of you may have already noticed, both consensus climate blogger and non-consensus bloggers are now locked in a symbiotic relationship. Much as we fume at each other, we actually need the other side even more than we need the support from people of our own persuasion. But I’m getting ahead of myself there. I’m forced to spell out again how I am so darn sure that CO2 causes some warming. Some of this seems like it’s too obvious but that’s probably because I work in optics and these equations are very familiar. When considering radiative absorption of CO2, we need to look at Plancks equation and the absorption curve of CO2. The spectrum of CO2 is important to consider. Note that all the absorption is at the far right end of the curve – long wavelengths – with high transmission in the visible .3-.65 microns. Also for the water vapor guys, there is a couple of clear CO2 peaks which fall at water vapor valleys — bad luck guys. Anyway the absorption curve of CO2 in Fig 1, doesn’t extend into the visible range. It is transparent to visible light though and you can confirm it by the total atmosphere curve which is an addition of the gasses shown. It turns out Phil Jones and cohorts did nothing wrong. Who knew? They claim hide the decline was a simple removal of erroneous data. A generously provided guest post by Tom Fuller of the examiner. Tom offered this to provide some rest for me to take care of the family. Tom’s writing style is quite a bit different than the usual fare around here, he’s a better writer -I think- and he compares this blog with Deltoid. The comparison is interesting because in my experience similar patterns of behavior and moderation are met across the whole climate blog community, not just a couple of blogs. As a note, I would add that the links presented here are completely selfish in that they represent the sites I visit. Not many blogs spend time making links just for the proprietor, but so far that’s all they are – my bookmarks. And finally, if you haven’t seen it, Tom Fuller and Steve Mosher have a book out which can be linked from the picture in the sidebar or at Tom’s site linked on the right. If you want to know for yourself what the climategate emails meant and you don’t have the background, this is the single best source. Guest post by Tom Fuller. I thought it would be interesting to compare two weblogs dealing with global warming to see if either similarities or differences might shed light on how opinions (and audiences) are formed, and what might be discerned about their contribution to the debate on this subject. Rather than singling out the highest traffic blogs (such as Real Climate on the consensus side and Watt’s Up With That for the opposition), I thought it might be constructive to take two weblogs lower down on the food chain. This is primarily because the most popular weblogs have become to a certain extent victims of their own success, and have changed their editorial practices to reflect the needs of a major media venue. Lower level bloggers can still pick and choose topics, style and levels of response and thus may provide a more accurate view of the actual debate.